As the eagerly anticipated start of the premier league edges closer, it’s that time of year where social media is bursting with Liverpool’s starting eleven predictions by fans around the world. Here I’ll have a closer look at our available players and reasons for them to push into the starting line up come August the 14th. With new arrivals and key players staying put, we’ve got enough attack minded players for two line ups but looking at this in a different sense, maybe this could finally crack the code for success. Where other years there’s hardly been any competition for places and most consistently played without they’re spot being under any threat, this season competitiveness is a new factor that Klopp’s brought to the table, making every player under pressure to perform or make way. Hence making this year the hardest yet to predict the team? Let’s start with the man between the sticks, well heartbreak early on for Loris Karius, fracturing a bone in his hand requiring surgery after accidentally punching Lovren during the pre season friendly with Chelsea. Many believed Karius would of started our campaign, mainly because he rejected the chance to play for the German Olympic football team to focus on his Liverpool career. I mean that’s confidence or maybe he knew something we didn’t? Either way it wasn’t to be as he’s looking at two months on the sidelines. Back to you Simon Mignolet then, and of course there’s a lot of negativity surrounding the Belgian after some mistake prone performances. I say lets get behind our man, and if it doesn’t work out, then Karius will soon be back for selection and we move on. 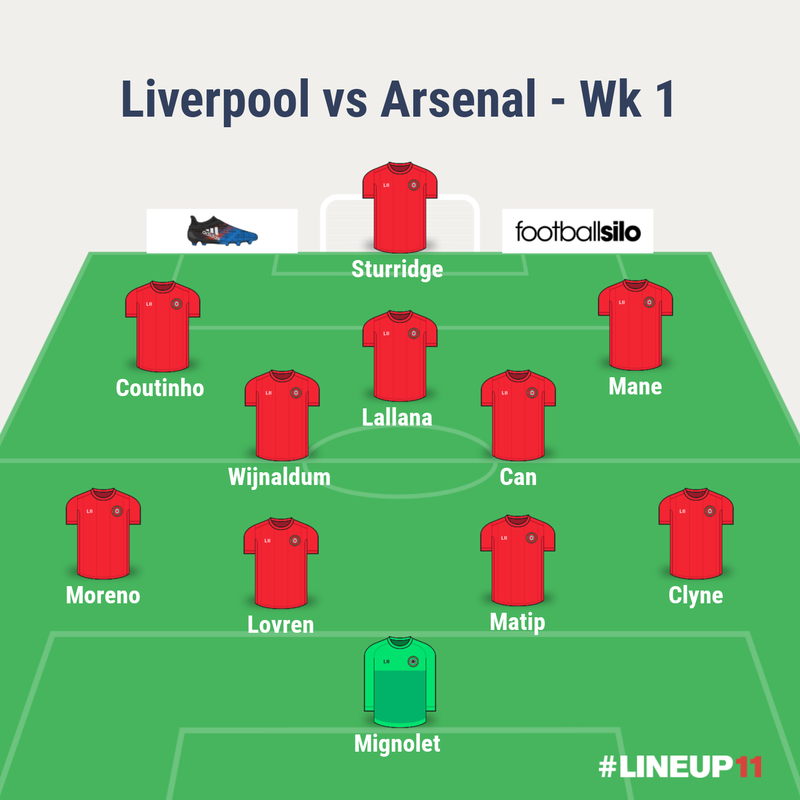 Alex Manninger is obviously back up also, but to start ahead of Mignolet would only beg the question, why keep Mignolet at all so I believe he’s in for the Arsenal game. I’ll take the easy option first with right back, as Nathan Clyne has quietly gone about his business and cemented his place with consistent solid performances. On with the centre backs, I won’t bore you with a repeat of the Sakho saga but this could well of effected his chances of starting at this time. Dejan Lovren in my books is a certain starter, looking more and more the player we paid £20 million for, not forgetting he is Liverpool’s most expensive defender in our history. Thankfully Klopp’s arrival has restored some credibility by making Lovren a key part of the team. That leaves a straight choice between two new lads, Joel Matip or Ragnar Klavan? Or is it, Matip is in contention to play this weekend after a slight ankle problem but with eight days to go til matchday is he fit enough? The last of the pre season games will help us judge that one. Klavan has shown us already he’s fit and the formerly unknown Estonian looks to suprise a few fans by boasting some solid showings, and could actually play a much bigger role than most of us first thought, wouldn’t be shocked to see his name next sunday. The well documented left back spot, and most will not be happy with Alberto Moreno as a starter, hold fire fellow Liverpool fans, yes defending wise he’s often elsewhere leaving that left position open to attack. On the other hand going up the other end of the pitch, he’s pacey, can take on players and a real creator. Problem is the conceding of goals outweighs the attacking option, at only 24 it’s surely too soon to completely give up on him. Often looking like a winger out of his comfort zone, perhaps with training and a better understanding of timing his runs, he could change a lot of people’s minds. Do we already have the answer to our full back conundrum? Yes, maybe after a James Milner cameo against Roma in the early hours of tuesday, that first half nearly all our threat began from Milner, overlaps, distribution and creativity, along with his work rate and desire to win the ball. A decent full back option and makes more sense defensively. Still feel this transfer window has a few surprises. This midfield holds some real tough choices ahead for Klopp with Can, Henderson, Coutinho, Firmino, Wijnaldum, Mané, Lallana, Grujic, Milner, Ojo and maybe Lucas if he’s still here? That’s a lot of depth and that doesn’t include some really improving youngsters. Me personally i think that Emre Can will start in a two with Henderson or Wijnaldum and will be more of a defensive duo, because of the attacking four in front of them (three attacking midfielders/wingers and striker). Mainly to stick to Klopp’s gegenpressing style of taking back possession and setting of the attacks in front of them. Very hard to tell what Klopp may do with Grujic? He’s looked so dominant and has had fans raving about the Serbian, netting twice before his concussion in the Chelsea (friendly not so friendly). The three joining our front man i believe will be Mané, Firmino and Coutinho. Mané will be out on the right wing linking up with Cylne which has to get you excited, all that pace, strength and Width! This could have us in dreamland these three being as tricky as anyone in the league, but so unpredictable in their play, could really mixed things up. Mané likes to get out wide, Coutinho loves to cut inside and Firmino adds pressing. All of them well capable of taking players out of the game with skill. I really do rate Lallana, his pressing often goes unnoticed and really is a catalyst for the whole teams effort. Whether he starts or not is a different question, I believe Klopp rates Lallana but I do think he might be on the bench for this one, as more of a impact player. Talking of impact there’s Ojo, Milner, Wijnaldum, who could all be seen as great options. Ojo’s direct way of flying past players and refusing to go backwards, is definitely a quality you need of the bench. Here we go, the main event that divides opinion and is probably the main talking point of most Liverpool fans at the moment, with Klopp’s favoured one up top it’s Sturridge or Origi? Origi’s second half against AC Milan was a real reminder that this young Belgian has bulked up and is ready to run riot! He’s looks such a natural these days on the ball, shrugging off defenders, creating a bit of space and finishing that’s improved no end. My opinion but really believe Marc Wilmots missed a trick at the euro’s by not playing Origi more. Daniel Sturridge of course is a complete technician on his day, having been hampered to bits by injuries, this could finally be the time for Sturridge to have a continued run in the team. All our new coaches behind the scenes perfecting his fitness and helping to build resistance to injury. He never lacks confidence or composure, really think that if fit he could have a real go at the golden boot. Last time he had a full season, he came second in the top scorer race only behind one Luis Suarez, 21 goals in 29 league games (not bad!). It’s not all about Sturridge or Origi, recovering from his own injury problems, Danny Ings is a third option that’s pretty much a Klopp player, hardworking, pressing, a bit of a english Dirk Kuyt and would add goals as he’s done in pre season. With the talent of Sturridge and Origi seemingly being favoured, that leaves Ings as that game changer, that will have to impact off the bench and really force his way into the side. Benteke looks to be off, with Klopp suggesting he’s a good striker but not right for our style of football. I’m in no doubt that Jürgen will suprise us throughout the season, but with this wise operator I feel we’re in safe hands folks!